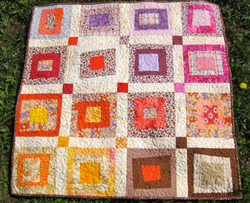 We take a huge pleasure in market by providing best quality array of Designer Machine Quilts. 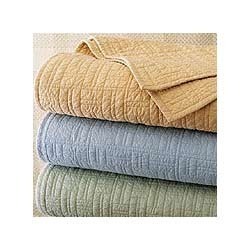 These quilts are available in many colors and designs as per the changing demands of our customers. These quilts are machines made and look very elite. Highly appreciated for softness and excellent finish, these products are available at affordable prices. • Choose (shown top to bottom) yellow, pink, green, or chambray blue. Owing to the dedication of our expert professionals, we are offering most beautiful looking array of Elegant Machine Quilts. These quits are available in several sizes and shapes at market leading prices. In order to design these products, we employ latest tools and techniques at the production unit. Offered products are quality tested to ensure global standards. • Choose (shown top to bottom) yellow, blue, or green. • Pillow (not shown), 14" square. 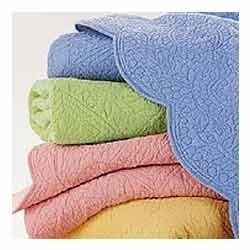 Our respected customers can buy most perfect quality assortment of Fashionable Machine Quilts. 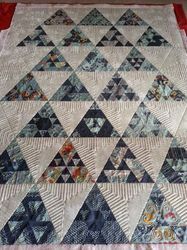 These quilts are available in various designs and colors. All these products are tested by our quality controllers to keep it as per market standards. 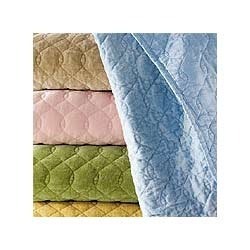 These quilts are soft and available at pocket friendly prices. Known for 100% cotton, these quits provide warm in winter. Our Machine Quilts is crafted with exceptional detail and care. It’s sewn of soft linen/cotton that’s plumped with cotton batting, then stitched in an intricate pattern with botanical motifs. 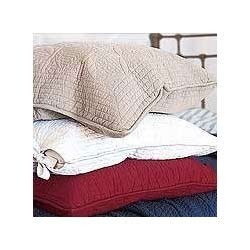 Use it on its own as a coverlet or layer it with patterned bedding. Coordinating sham is trimmed with piping and has tie closures (insert not included). Hideaway Linens Turn your bed into a tropical hideaway with these sweet springtime linens. 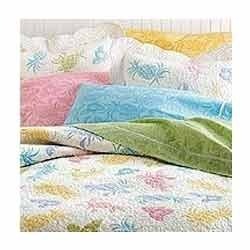 • Hibiscus Hideaway Linens, white with multicolor pineapple design. • Quilt, cotton. • Dust skirt (not shown), pink lemonade, 300-thread-count cotton; 15" drop. • Sheeting, choose (shown top to bottom) yellow, pink lemonade, sky blue, or lime. 300-thread-count cotton. Complete the look of your bedding ensemble with these reversible velvet and satin accessories. Choose (shown top to bottom) sky (blue), taupe, petal (pink),pistachio (green), or honey (yellow). • Reverses from velvet to satin. • Pillows and shams, velvet with satin ruffle. 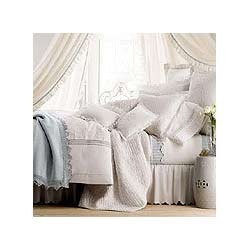 Beautiful bedding with intricate details you'll treasure. • Choose white (shown), light blue, or stripes. • Fagoting, quilting, and scalloped details. • Dust skirt, 14" drop. • Sheets, choose white scallops or light blue stripes; 200-thread count. Looking for Machine Quilts ?